Kids blueberry recipes provide fun for kids and adults! 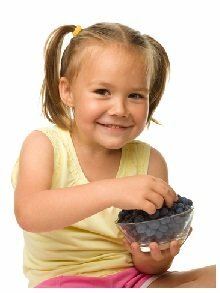 Blueberries are great snacks for kids because they’re packed with powerful nutrients. Cooking also gives kids the opportunity to develop physical skills – both fine (fingers, hands and co-ordination) and gross (arm and body) motor skills while stirring, whisking, chopping, peeling, beating and kneading. Kids who learn to eat well may be more likely to eat healthy as adults. Blueberries are a new super food - packed with power from their rich blue color loaded with antioxidants. Help support your child's health by encouraging the consumption of these tasty berries.